At one point in the Coen Brothers’ No Country For Old Men, Tommy Lee Jones’ Sheriff, lamenting the violence of the modern world, opines: ‘I laugh myself sometimes… Ain’t a whole lot else you can do’. The same sentiment applied here -it was fascinating to see how Dr Strangelove’s dark humour both went against and complemented the gloomy message of Walker’s documentary. It’s not just that both films concentrate on nuclear war. This double bill was also proof that cinema is one of the most potently humane and flexible art forms in the world: just as Walker’s film chillingly lights the rocket under our seat in alerting us to the nuclear threat, Kubrick’s film implodes our fears from within, mocking humanity’s penchant for self-destruction and flagging up how silly it all is. Why would we want to destroy ourselves when humanity has so much to offer? Walker’s film consequently is hardly a joyous affair, appropriately cloaked in an air of dread from the outset. Yet, it’s remarkably even-handed. After all, one country’s fear is another country’s propaganda tool -the focus on recent nuclear development in Pakistan rams that home, and such insights make for queasy but compelling viewing. What’s really chilling are the mundane details: one key that could spark off a crisis; the anguished face of J Robert Oppenheimer as he cites the famous Hindu quotation, ‘I am become death’. 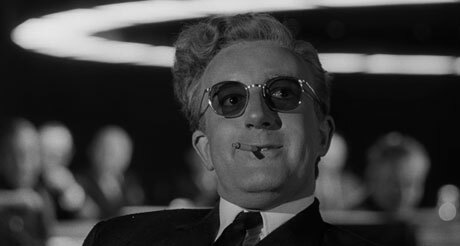 Following that was a screening of Kubrick’s black comedy Dr Strangelove, which, although it was released in 1964 just after the Cuban Missile Crisis, continues to add further philosophical wrinkles to our understanding of this modern threat. Like a fine wine, Kubrick’s film only gets better with age, the minutely calibrated performances from the likes of Peter Sellers and George C Scott beautifully lampooning human paranoia. Ken Adam’s sets are wonderfully minimalist, and if only the issues of the world were as black and white as Gilbert Taylor’s cinematography. Yet away from the impeccable technical credits of both films, one recent, the other an undisputed classic, it was fascinating to see how they were able to communicate the same issues but in radically different ways. Walker’s film is a documentary designed to unnerve and inform; Kubrick’s is a satire designed to make us laugh at things we shouldn’t really laugh at. Yet the human principle is the same in both movies: for humanity to destroy itself would be a ‘silly thing’ indeed (as Sellers’ President Merkin Muffley points out over the phone). It’s further proof of the Barn Cinema‘s firm commitment to provocative, stimulating screenings, and earmarks it as one of the most exciting cinemas in South Devon.